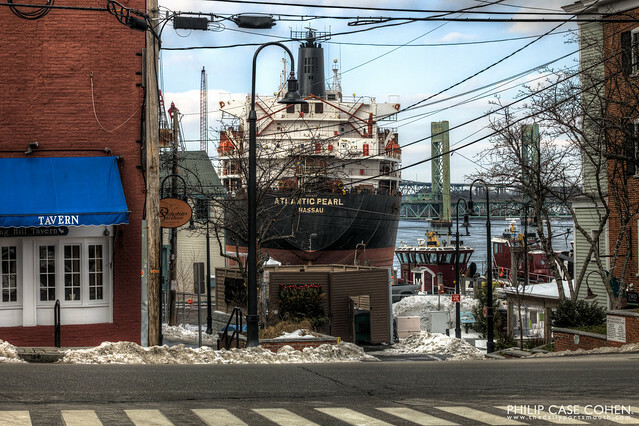 The Atlantic Pearl as seen from Penhallow Street. I’ve always loved the imposing presence of a freighter next to the tugboats from this angle. It fits right in with the scale of the multi-storied buildings surrounding it, and is a sight that’s probably not seen in many places around the country. It’s always a reminder of where we live and how unique it is. I can’t imagine what it would be like to watch merchant ships unloading centuries ago in this very spot. That is a pretty unique visual! Well seen! Way awesome! I was walking down Penhallow Street this week and saw this sight. I immdiately hoped that you had as well and were able to capture it. Very nice! Nice shot, Philip! I’ve tried to draw this view, but the ship is so big it makes the drawing look wrong. Thanks Bill! I would LOVE to see a Paarlberg original of this vantage…monster preferred, but certainly not required. Happy New Year!